Service users have their views, opinions and experience, yet how often are those views sought, listened to or passed on? At SEASONS we have a several very active service users, some of whom have written enlightening accounts of their experiences with mental health. Alistair had his published (see this link to buy the e-book) and others are now writing and voicing their tales. Alistair has now written another book! Everyone at SEASONS is very pleased and happy for him. 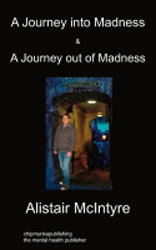 His second book A Journey Out of Madness is now available along with his first book from Amazon, Waterstones and Tesco. 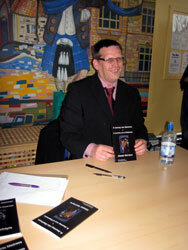 Alistair, who is now working at the Moredun Community Health flat, made 2 public appearances to promote the book. Below 2 of SEASONS’ service users share their views of Alistair’s reading and the book. 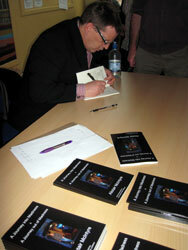 Alistair signing copies of his book. Below Albert R.N. shares his experiences of his involvement with Patients’ Council. Read Albert’s introduction then read his book. Buddhism Beats Depression – an article about how the health services are sponsoring Buddhist techniques to beat depression. Oxford University researchers testing meditation as form of therapy. My involvement with Patients Council began ten years ago. By association with fellow customers, it became apparent I could revisit the psychiatric programming I had been channelled through. 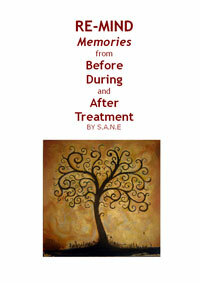 Due to past treatment, the experiences I had had were locked away in my mind’s eye on indefinite hold. Reactivating these hidden memories brought clarity of what had really happened to me and why they and I had reacted in the way we did, in the “good old, bad old days”, of the sixties and seventies. A score of years mark the distance my suppressed subconscious had to travel, through E.C.T. and a whole series of drug cocktails, till my behavioural patterns became acceptable. They never ever told me what was ‘right’ with me, never mind what was ‘wrong’ with me. When I joining the P.C. I was already twenty years into a personal recovery outwith psychiatric intervention. Being a member, I hoped to share and to learn what might be useful to help us on our individual journeys. To free myself from drugs I used a whole raft of holistic principals to keep me on the straight and narrow. It has taken me all of fifty years, hopefully to resolve in my mind, my own and society’s psychological problem not just with me but also with society itself. The root of my difficulty – before, during and after treatment – unaccepted by society, was rebellion against unresolved collective abuse. Recall has been unexpectedly forthcoming, with tentative release of suppressed second nature. By comparing notes with fellow customers/victims, the truth has become so much clearer. Abuse would appear to be the prime mover and shaker, in most, if not all, so called mental health difficulties. In the field of mental illness, the patient is not only the victim – a socially induced scapegoat – but a diagnosed symptom. Members of parliament, naively wonder why mental health ‘customers’ commit suicide. With the triple whammy of abuse ongoing for me, I surely know. I was sorely tempted to end it all, at least upon one occasion. In recent years, the mounting work load of the Patients’ Council has opened up our involvement, with more and more interested parties – N.H.S. professionals, staff, patients, customers, carers, and the general public, all moving forward, to ensure an enhanced quality of life across the board. The real bonus for all employees and customers concerned will be ongoing job satisfaction, enhanced by a more amicable home life for staff and patients. I have been involved with an independent charity “The Patients’ Council” for the past ten years. My interest was drawn by a fellow traveller I met at a Manic Depressive Conference. After extensive conversations with me, he felt I may be able to help out. I have been blessed in recent years with hands-on-involvement, as the pace has moved to a greater acceptance and understanding. We used to do both independent and collective advocacy. Five years ago, however, we gave up individual advocacy to paid trained advocates to facilitate customers in the Tribunal system. We hold collective advocacy meetings in wards, involve customers of the service with two patients council representatives hosting. Confidentiality at these meetings is the name of the game. The main thrust of these get-togethers, is to highlight any anomalies in the ward which affects the residents collectively. We notify the staff of any collective residents requests and problems. If staff are unable to get any result, we can pass the information on to a higher authority, in the hope of resolution. The result of our designated involvement has improved the atmosphere across the board. Staff moral has improved, adding to job satisfaction and a less stressful home life, for both staff and residents.